Join us for an evening of fellowship, food, and wine at the club's annual First September Event! All over the world, First September is celebrated by alumni clubs to welcome recent graduates and young alumni to their local communities. 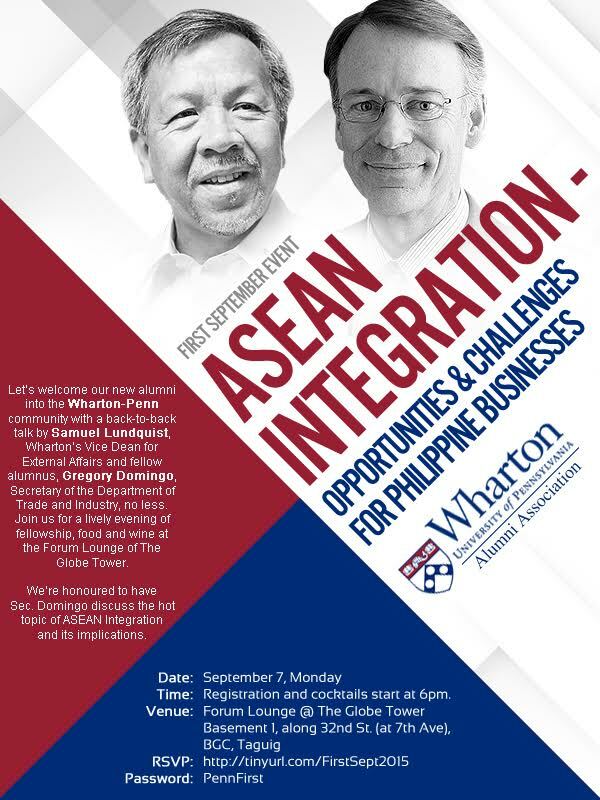 In line with all the talks on ASEAN integration, the club has invited Department of Trade and Industry Secretary Greg Domingo (Wharton '82) to speak about its implications for Philippines businesses. We are also welcoming Wharton Vice Dean Sam Lundquist to town as part of his Asian tour to discuss Wharton’s international activities. This event is exclusive to Penn alumni and their guests. Looking forward to a lively evening of fellowship, food, and wine! RSVP by September 4, 2015. See you there!